Sorry, guys I was in a meeting for a while but no, no Claes nor Gendebien. To help you no Swaters, Pilette (André) or Legat either. Guy Mairesse was a Frenchman. Yes, that's Parsons (once again)! His name is menetioned as "Johnny Parsons" on the Borg-Warner Trophy, but he has always been known to racing community as Johnnie Parsons. 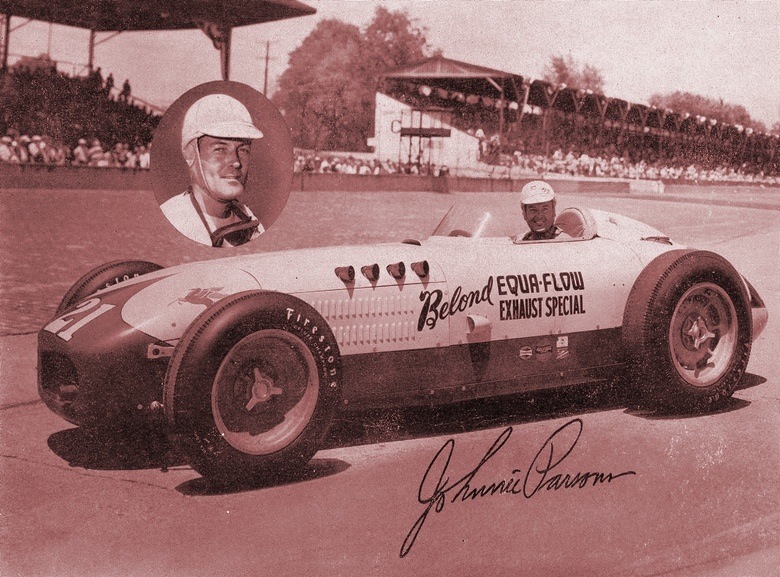 Name "Johnny Parsons" was later used in racing competitions and Indy 500 by his son from the first marriage, being born as John Wayne Parsons. Obviously you are looking for Roger Laurent and his victory behind the wheel of Ecurie Francorchamps' Talbot-Lago T26C in 1952 Suomen GP. The race was held in the downtown of Helsinki and was run to F1 rules. The victory was achieved only in the last straight of the last lap and crossing finish line Laurent was only a tenth of a second ahead of Swedish Erik Lundgren. That was maiden race for the rebranded Ecurie Francorchamps (in 1951 it had been raced as Ecurie Belgique, but after the end of the season the Royal Automobile Club de Belgique didn't sanctioned to use this name for private team, so they renamed themselves as Ecurie Francorchamps) and it achieved a victory in the first outings. Good start that was! Yes, where did it go? Now my rebuttal of your answer looks completely silly! This one was taken at 1953 Indy 500 gathering, and I'm sure it sort out any questions. Edited by AAA-Eagle, 18 July 2016 - 09:29. Yes, I know. Jimmy Wilburn also always signed as "Jimmie", but what's the difference? I assumed you were losing your marbles and were just making random statements. Can we all have a go? Rats! Thought I'd got away with that! Well this is not the case as he didn't win the International Sweepstakes. But I have pointed to Parson's signature to explain quickly that it's doubtful statement on your side that the man was entirely recognized as Johnny and not Johnnie. For some reason I cannot make quotes today but this is an answer to post 105 by Michael. Surely one can argue endlessly what is or is not a Formula 1 race. Don't think though that this is the thread where we should do it. And I think the spirit of the thread is to make things a little more tricky than the obvious, no? Ok guys, the next one. Name the earliest known case when chequered flag in a WDC race was mistakely shown to a leader a lap before it was needed to be done. Edited by AAA-Eagle, 18 July 2016 - 10:33. Should have been cut off at 57 laps not 56. Brambilla would have been second and both Ferraris would have been in the points. What's not to like? Yes, yes and yes. I guess I was just a bit miffed because I was thinking of both Parsons and Laurent but didn't post because I thought the answers were too silly. Back to Eagle's question: I'm sure I'm missing a Toto Roche story here, but my answer is Argentina 1978. Good try, but think of another race. Don't know what those misterious newspapers are, but my Floyd Clymer's yearbooks clearly show "Johnnie". Mine show Johnnie, Johnny and Jonnie. Within a few pages. Well, back in ye olde times, people used to get their news from printed paper, usually in some oversize format, sold at so-called "newsstands" and made by editorial teams in every middle-sized town around the country. Quite handy. Way off topic from Parsonsgate, but 1965 South African GP? Bingo! Eventual winner Jim Clark was waved chequered flag one lap earlier, but still completed another lap as his team indicated there is one lap to go. So inspite of initial error the race was run on sheduled distance. Anyway - in which year did a rear engined car first actually manage to win a race on the US national championship trail? 1965 is too obvious so I'll go for 1965. Closer than John (by 2 full years), but no. Edited by E.B., 18 July 2016 - 20:30. Indeed. Then it should be 1937 with Rosemeyer winning Vanderbilt cup race. That's the one (as far as I know!). Curious as to why you didn't go for that one first! Edited by E.B., 18 July 2016 - 20:48. Somehow I forgot that Vanderbilt Cup was eligible US national championship event; this and also my recent thoughts of Clark led me straight to Milwaukee. But after your comment I have nothing to choose from, as everything became clear for me. As for the next question: name chief designer/technical director who holds a record for biggest amount of WDC races in which constructed by him cars have participated.. Given that modern WDC/Grand Prix seasons have so many more races than in earlier times I assume it must be someone fairly recent; Adrian Newey? Correct. With 472 WDC races and 475 WDC GP (1988-2005, 2007-onwards) Adrian Newey is on top of the list. Here's the next question. Where and when did Carlos Reutemann pip Niki Lauda, with another Brabham third? And why was Dave so happy? Quick guess: 1978 British GP. Dave who? Dave who? Good question, Michael! As you say, Carlos did pip Niki at Brands in 1978, with another Brabham in third (John Watson). But no, that's not what I'm after, not the 1978 British GP. Earlier than 1978, and Dave was directly involved. So it must be an early 70s F2 race, and Dave perhaps Dave Morgan. I'd have to check some books to make a call, is that within the rules? Second heat of the 1972 Mallory Park F2 opener. Morgan was overall winner! Full marks to Mr. Ferner! Yes, Dave Morgan was the surprise aggregate winner in (Ed Reeves'?) old BT35, keeping Lauda and Reutemann in sight in the second part, having won the first. It must have been very satisfying for Morgan after the stick he took in 1970. I was at Mallory in 1972. It was a bright spring day, big crowd and some top names, even with the non-starters you expect for the first race of the F2 season. I remember, I think, Ronnie Peterson being easily the fastest (red STP March 722? ), but retiring in the first part. Records show he must have been allowed to start in the second part, but crashed on lap 3. I was at the esses, but can't recall anything about Ronnie's accident. If I'd been there in 1971 I would! A few weeks later I saw Ronnie dominate at Thruxton where hardly anyone finished. Okay, my question needs a bit of a explaining: many years ago, I had some spare time on my hands and devised an "Alternate F1 Championship" (as you do) on the basis of lap-by-lap standings. That is, I assigned the same amount of championship points as in the real world, but broken down into individual lap standings, so that the leader in a, say, 50-lap race got one fiftieth of the points for a win on each lap led, the second-placed driver one fiftieth of the points for second place and so on (I hope you get the idea). This was quite interesting, as drivers leading much of the way but retiring close to the finish still scored a lot of points that way, and the "Championship" often took on a very different complexion. Once, the driver leading in points went into the last race of the season needing only one single lap in sixth place to clinch the "title", while the runner-up needed to lead every single lap of the race in order to overhaul him even if he failed. What happened was exactly that: driver A dramatically failed to break into the top six, while driver B led flag to flag to win the "Championship" in the last minute - literally!! Alternate reality can be so much fun! What was the year, and who were the drivers involved? Yes, a bad loser Newspapers consistently made the same error that the engraver of the Borg-Warner Trophy did. Anyone with a less common spelling will automatically become the more common in most newspaper accounts. Which doesn't make them right! Edited by Jim Thurman, 19 July 2016 - 15:24. Torn between 3 different seasons, and remarkably they are consecutive. Eeny meeny, I'll say Stewart over Emmo in 1972, ulcer notwithstanding.